Organize my life for 0.17 cents? Yes, please! I am by nature a list maker. If by chance, you are a fellow list maker, then you KNOW that even with the best of intentions, the list gets lost. How? Why? No one knows. It is like the lost-sock-in-the-dryer phenomenon. They are as good as gone. Might as well diligently write a list, then rip it up and burn it. What if…. you never lost a single list again? All ideas were findable? A whole year of your genius was at your fingertips! Interested? Spiral notebook planning. Say it with me. Spiral notebook planning. I cannot claim any credit for this revolutionary idea of using paper and pen to organize my life. Through Periscope, I found and listened to homeschool moms live chat about all sorts of topics. Anything organization-related had me at hello. One mom said she buys spiral notebooks in large quantities at the back to school sales. 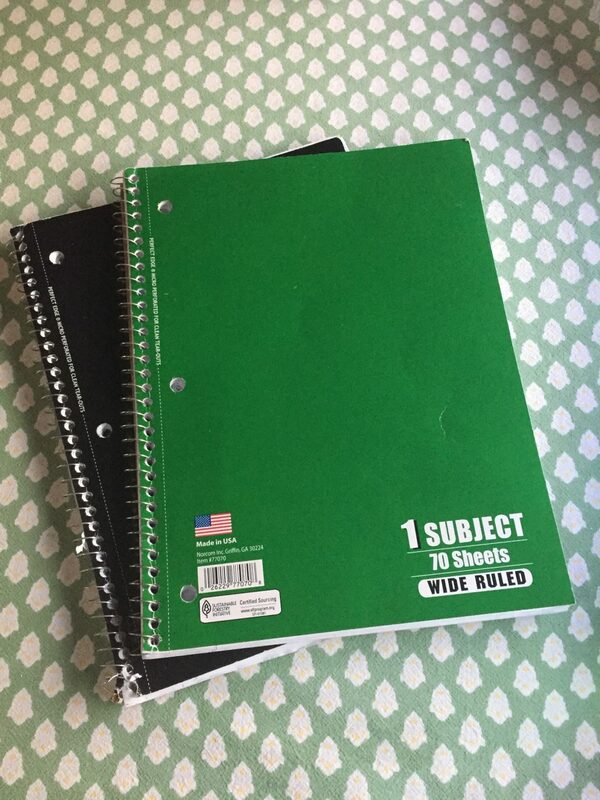 So I marched out and purchased a stack of spiral notebooks – 0.17 each! The idea is simple. When inspiration strikes, open to a clean page and write it out. Bills to pay. Shopping lists. Birthday planning. Books to reserve at the library. An appointment you just made. Then sit back and revel that the note will not be lost in the fray. [Unless people in your life typically throw notebooks away. If they do – no judgement here – but this might not work for you.] Even if you have three notebooks going at once, it is totally doable to find your note again. I use (in theory) one notebook for my weekly plan. 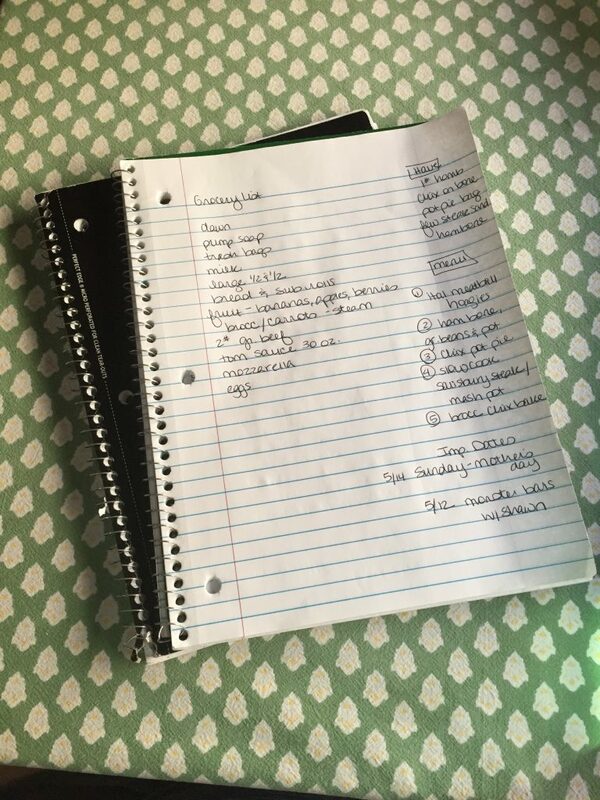 In real life, I will use whichever notebook is currently open on my kitchen tale. This process of writing, whenever inspiration strikes, about any topic, is freeing. I don’t need a certain journal or my phone. My scribblings will not mar an otherwise lovely bullet journal. When I’m done with the note, I can save it or tear it out. No harm done. If you are interested in more, click here to see my weekly plan.